On the ground of PVC-MS harbor, PetroVietnam Equipment Assembly and Metal Structrure Joint Stock Company (PVC -MS, stocks code: PXS) has successfully launched the Thai Binh exploiting rig base. The Thai Binh exploiting rig invested by the Petronas Carigali Overseas Sdn Bhd Company (PCOSB) belongs to lots No 102 and 106 under Thai Binh mine development project in about 20 km from Tien Hai district (Thai Binh province) to the southeast direction. PVC-MS as a EPC contractor of the project, responsible for the design, procurement, manufacturing and testing for the base, piles, the upper block and the other supporting structures of the Thai Binh rig. The project has an about 2000 ton total structural weight. Today, after more than 9 months construction, PVC- MC has completed Thai Binh base in time with a good quality and ensuring absolutely safety. 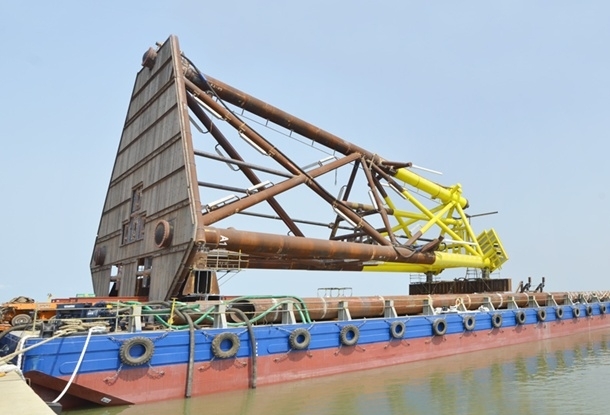 Besides, the upper block of the Thai Binh rig has been also completed and it will be shipped to the barge on March 30, 2015 with an aim to be put to sea on April 2, 2015. According to the plan, PVC- MS company will connect and test Thai Binh rig offshore before handing over to the PCPSB investor at the middle of April 2015.